The motor-driven metering pump Sigma X Control with new operating unit and DULCOnnect offers an intelligent solution for digitally linking the system components. Manufacturer of metering pumps for digital fluid management, ProMinent, is now offering the new Sigma X range of motor-driven metering pumps. On display recently at the ACHEMA trade fair, the Sigma X range represents the evolution of ProMinent’s Sigma product range. The company says it combines durability and process reliability with a new and uniform operating concept and comprehensive connectivity. 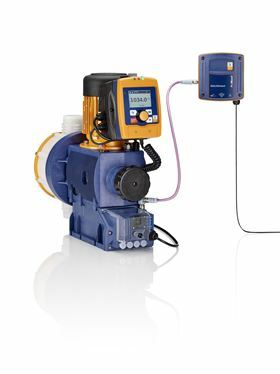 The pump is an integral part of ProMinent’s new DULCOnneX range of solutions for digital fluid management, and the new Sigma X motor-driven metering pump features integral Profibus and CANopen interfaces for connection to process management systems, Bluetooth and wi-fi. As a result, the Sigma X enables the simple monitoring, analysis and optimisation of metering processes. This not only minimises the consumption of raw materials, operating errors, and downtimes, but also offers improved customer service through networking, transparency, and automation.